People of all ages perform bodybuilding exercises for the increased strength, health and physically fit appearance they produce. These heavy-resistance exercises place a large amount stress on the body, which reacts in different ways at different ages. Changes to your body that affect how it reacts to bodybuilding occur after 20 years and after 50 years of age. The muscles and skeletons of children and teenagers are not fully grown, so bodybuilding might be best postponed until after age 20. Bodybuilding -- or strength-training with lighter weights for younger people -- is safest and most effective when you follow the proper form and workout guidelines for your age group. Many teenagers and even pre-teens lift weights with the goals of increased muscle and improved sports performance. The training guidelines that apply to adult bodybuilders must be modified for pre-adults because they haven’t reached full musculoskeletal growth. The American Academy of Pediatrics recommends a medical evaluation before children and adolescents begin a strength-training program. Also recommended are starting with lighter weights to develop proper form, regular cardio exercise and avoiding heavy weightlifting until full growth is reached. The most common injuries younger bodybuilders experience are muscle strains, mostly to the lower back. Between 20 and 30 most people have reached full growth, and at 20, you can safely begin building up to lifting heavier weights. This is the time of life that allows you to lift the most weight with the shortest necessary recovery time. Take advantage of these years to bulk up and you will be less affected in the future by the gradual loss of muscle that occurs naturally with aging. The muscle recovery period for 20-year-olds after working out with maximum force is about two days. By age 30, four days of recovery time may be required. These recovery periods, vary by individual, however, according to World Fitness Network. Beginners lifting lighter weights will need only about two days, while those who lift extremely heavy weights may need as many as seven days, regardless of age. 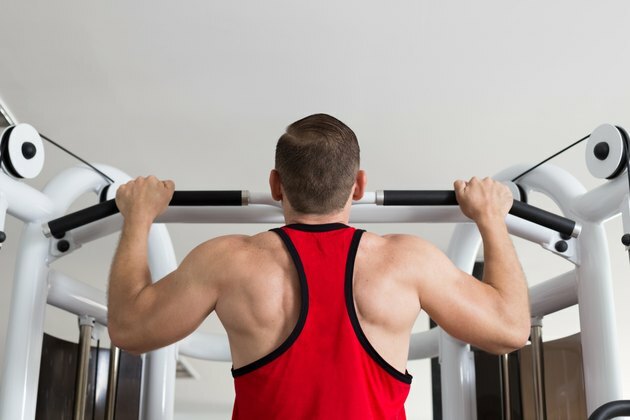 At age 30, muscle strength and recovery ability have decreased due to aging by about 10 percent from age 20 and are declining at a rate of about 1 percent per year, according to Exercise Prescription on the Internet. Thereafter, a weight reduction of 5 percent every 10 years is recommended. The muscle recovery time after heavy weightlifting will increase from about four days at age 30 to about seven days by age 50. Trying to force your body to perform as it did during your 20s will produce less muscle gain and may result in injury. To achieve the most growth of mass and strength during this time, pay attention to your body’s changes and adjust your workouts as needed. As you age, muscle, bone and connecting tissue mass naturally decrease along with hormone production. Research shows that bodybuilding counteracts this effect, even in people over 90 years old, according to the University of New Mexico. After age 50, reductions in weight and increases in rest time should be made based on individual needs. Professional bodybuilders compete in their 60s, 70s and 80s -- some after having started in their 50s, 60s or older -- staying strong and looking much younger than their actual ages. Can I Start Bodybuilding in My 50s?